Then: There was always corruption in the PRC, but Reform & Opening Up made it much easier and much more visible. In the 80’s, many price controls were lifted, but not all. The shortages of some goods allowed people with the right connections to buy at the artificially low prices and sell at market rates for huge windfalls. So naturally, the already-powerful became even more powerful. The inequality of opportunity and obvious abuse of power were two things immediately visible to those affected and were direct causes the Tiananmen protests. Now: You can click here to see a visual approximation of China’s Gini Coefficient wealth inequality over time (0 means perfect equality, 1.0 means one person has all the wealth). In 1989 it was hovering around 0.36. It took a dip that year but has since soared to over 0.47 – well past the 0.40 danger level. China’s crony one-party capitalism and massive economic growth since Tiananmen have only increased the amount of capital involved with corruption and allowed the powerful to get exponentially wealthier. This is perhaps best felt when local officials make illegal, undercompensated land grabs to raise capital for their city (and often take kickbacks from developers). A recent survey found the number of disputes over these land grabs is at an all-time high. Favoritism, graft and inequality of opportunity are in some ways better than the Tiananmen era, but in many ways much worse. Then: The Chinese media of the 1980’s covered issues that had never been touched in the PRC previously; even dabbling in corruption cases. Single essays or TV programs could stir up fiery political discussion on college campuses. A documentary called River Elegy played on CCTV in 1988, which subtly criticized Chinese culture and sparked nationwide debate. When the protests themselves started, the press covered them extensively and even portrayed the student protestors sympathetically. These factors shined a light on many issues intellectuals were concerned about and brought together like-minded activists. Now: Though the official press was reigned in after 1989 – where it’s more or less stayed ever since – new avenues of disseminating information have sprung up. Mobile phones, blogs and microblogs have put reporting in the hands of those directly affected – shining a light on things never before seen by most common people. Shrewd online political commentary on these issues by bloggers like Han Han may be playing a role similar to programs like River Elegy in the 80’s. Then: After the Cultural Revolution, universities re-opened and were a sure ticket to a better life. However, with further reform and opening of the markets in the mid-to-late 80’s, many college students graduated to find their education gave them no real advantage in the new business landscape. In 1988, the system that assigned college graduates jobs was also amended to where private companies could reject those top students assigned to them in favor of those who had connections inside the company. Now: Educational prospects improved after Tiananmen, but now the situation is coming to resemble 1989 again. An overabundance of college graduates has left one-fourth of them unemployed without any better prospects than those who didn’t go to college. Many have also criticized the university system as useless, largely focusing on theory and failing to give students useful practical guidance. With labor wages rising China needs to move up the value chain in order to keep its people employed. Some think the innovation and collaboration needed to achieve this won’t be possible under the current intellectually repressive atmosphere. Now: Inflation is sitting at about 5.5%, down from a high of 6.5% in July. Not nearly as bad as pre-Tiananmen, but food is getting less affordable and housing is off the charts. With a roughly 32 million surplus of marrying age men, great pressure is being put on those who need to buy a house (and often a car) to compete for potential wives. And the poorest of the poor are having to cut food from their diet in order to stay on top of their finances. Then: In the lead up to Tiananmen there was an obvious rift in the party between progressives like Zhao Ziyang and Hu Yaobang and hardliners like Li Peng. This rift was absolutely apparent in the days leading up to the crackdown. The protestors saw this split and sniffed weakness; which emboldened them further. Now: After Tiananmen the party learned to present a united front in public and keep disputes between factions – or even the existence of factions – behind closed doors. That era seems to have ended now though with Bo Xilai’s left wing and Wang Yang’s right wing both making very public criticisms of each other’s models. The bulk of the Chinese public has yet to express an interest (or knowledge) in this feud, but that could change as factions push harder for influence and citizens begin to take sides. Then: In the late 80’s Chinese banks flooded the market with loans. As could be expected, a great deal of them went bad and an estimated 1/3 of factories were unprofitable. The government brought this to an abrupt halt in 1988 by cutting the cash flow – a kind of austerity measure many didn’t take too kindly to. Now: Take that same situation and multiply the figures involved to equal more than seven times China’s entire 1989 GDP. In the wake of the 2008 financial crisis, China pumped $586 billion into the economy as a stimulus. This is part of an overall $2.7 trillion Chinese banks have extended in loans over 2009 and 2010. Up to now that stimulus has looked pretty good in economic recovery terms, as it always does…until the loans start going bad. Wenzhou has recently had dozens of bosses flee bad debts – something that’s being read as a preview of larger things to come. Tsinghua economist Patrick Chovanec has said he’s not sure if China can make it through next year’s power transition before a major banking crisis hits. Since Tiananmen the government has pretty successfully educated nationalism into the youth and trained them to regard any talk of democracy or human rights as a western ploy to make China implode. The relatively well-off youth of today also seem far more interested in video games and pop stars than politics anyways. And the population as a whole is undeniably better off than they were in 1989 (though some studies suggest they’re not any happier). Most have a lot more to lose than they did at that time. The technological improvements may work to the Party’s advantage more than any would-be revolutionaries. The government has the capability to monitor and immediately clamp down on dissent – a capability that improves by the day. If they were truly threatened by a spontaneous movement, they could temporarily shut down cellphone service, microblogs like Weibo, or even the entire internet – as they did in Xinjiang in 2009. And as the Beijing attempt at a Jasmine Revolution earlier this year demonstrated, the government will come down hard on any threat – real or imagined. And they’re very careful not to allow any large gatherings that they can’t fully control; as the turnout for Hu Yaobang’s funeral in 1989 was the final spark for the Tiananmen Protests. Given the vast similarities between now and 1989, another go at a revolution seems possible. If history is any indicator, an iron fist can’t succeed by itself if grievances are too great and you have the right catalyst to bring the disenfranchised together quickly. Probably the only leader popular enough to create this Hu Yaobang-like catalyst in death would be Wen Jiabao. But again, if that happened the party would be overly cautious; and it probably wouldn’t be enough anyways. It would have to be something big that directly affected a huge number of people. A large scale disaster that could be linked to corruption or official incompetence might do it. The Wenzhou train crash earlier this year and Shanghai fire last year made a lot of people angry and concerned for their safety. They weren’t big enough to spark an uprising, but they were two of many small aggravators that are slowly ebbing away people’s patience with corruption and government cover-ups. If something like a nuclear meltdown, a mass public health incident or a large dam collapse happened, that just might break the camel’s back. In 1975, the Banqiao Dam in Henan collapsed killing 171,000 people. And if you think that’s something relegated to the incompetence of the Mao-era, an average of 68 dams still collapse every year in China, according to one official. But an even more likely scenario would be a poorly timed financial crisis; one like the aforementioned banking crisis that many are predicating. Life is already getting rough for the post-80’s/post-90’s kids who grew up spoiled taking economic security for granted. The job market is shrinking, their time/money intensive education is often useless and the gender imbalance is leaving many men hopelessly single. To make matters worse, the 2010 ratio of five workers for every elderly person will drop to 3-to-1 by 2020 in what Time Magazine has called “China’s Demographic Time Bomb.” For many only children that means completely supporting two parents financially and physically amid some of the least affordable housing prices in the world. If a housing bubble burst robs these people of the investments they’ve become slaves to, they might all-of-a-sudden take a very keen interest in politics. And if there’s a banking crisis, it would likely cause a run on banks and panic buying similar to what caused the massive inflation of 1988. Fitch has estimated there’s a 60% chance of such a crisis by mid-2013. If it comes any earlier than that, it would be right during the leadership transition when the party is at its most vulnerable. I’ll give my standard disclaimer for any internet police or fenqing that might be reading: An uprising isn’t something I’m hoping for. It’s not even something I’d venture to predict. Predications of a CCP collapse have a way of making you look like a fool (See: Gordon Chang). And even if an uprising did happen, it doesn’t mean the party wouldn’t survive it. But there are many cracks beginning to show – financial, political and social; figurative and literal. The Beijing Consensus of authoritarian led economic growth has delayed the Party’s need to address their legitimacy shortfall for a solid 22 years, but one way or another that growth eventually has to slow and the legitimacy issue has to be addressed. If I were in charge I’d focus a bit less on the iron fist and a bit more on the root problems distressing and disenfranchising those without financial and political influence. Dingxin Zhao. ‘’The Power of Tiananmen: State-Society Relations and the 1989 Beijing Student Movement’’. Chicago: University of Chiacgo Press, 2001. ISBN 0-226-982600-2. pp.127. Great post, I think all of the similarities mentioned are already big concerns for the Party. Chinese revolutions tend to rely on supports from peasants, so it might be helpful to consider whether or not farmers are better off than they were in ’89. I would argue that they have fallen further behind their urban counterparts, and are more keenly aware of the GINI gap you mentioned. Rural dwellers are also more connected to urban areas through migrant workers, and it would be much harder to contain news of such a protest these days. Okay, pretty good and seamless overview, but just what do you mean by revolution? How do you theorise its shape and form. Will this potential revolution encompass the entire social formation? Rural v urban. Breakaway provinces as local leaders take the populist path to maintain power. Rich v the poor. Migrant workers and ant people v everybody. Vow populi v the Party ‘in crowd’. How about the coastal provinces v the rest. What will be the PLA’s position. The permuations are endless given the complexity and size of China. This is something rarely discussed after revolution or accelerated political change are mentioned. I’ll be doing a post later on what post-revolution possibilities might look like, but you’re absolutely right. There are many different permutations – and few of them look good. In a nutshell, I think it would be largely rich vs. poor (with many wild cards), just like nearly every revolution in China’s history. A leader rallies the peasants on promises to redistribute wealth and land equally. They do so and over time the wealth gets skewed again. It’s a cycle that always repeats itself. But I don’t necessarily think the Party wouldn’t survive another uprising. They’re pretty good at doing anything to hold on. Great article. Just one point, I don’t think the death of Wen Jiabao would trigger something like Hu Yaobang’s death did. A lot of people already don’t like Wen and call him an “actor” for justing giving speeches and no real actions at all. Also, his son and wife are both in very powerful positions, further making him look like a part of your common CCP instead of a good official. I still don’t think any large scale uprising is possible in the near future. The Nationalism education is way to successful. They told us about Jingoism in WWII Japan, but we have never realized we’ve been imbued with something quite similar! hi, i am a post-90′ Chinese. i have read your article, a Chinese translated vision. your view is real excellent. i do not think anyone’s death will rise a revolution.because china is already not a heroism country compared with 1989 age. No political man that ordinary people already know today is likely to Hu Yaobang, many people do not know Wen Jiabao’s viewpoint because of some censorship. people do not care about politics included today’s college students. as a new generation, we love pop star, american movies , KTV, wine, high consumption. i care about history, politics, public affairs but merely guys want to listen to my voice, i concede we as a whole, are fairly realistic. social debates on public affairs are needed but the authority won’t allowed. however, maybe a economic crisis will arise the awareness of revolt. and i think the enlightenment of the universal values- freedom, democracy are essential to our nation’s future. 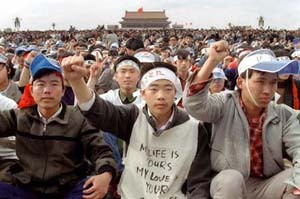 I realize I’m late to the party here, but I think there is something missing from the conditions listed, although it may be hinted at under “Nationalism and Affluence.” That missing something is the ideational conditions that led to the Tiananmen protests, specifically the belief that something new and better was possible. As @leo says above, these days a cynical consumerism seems to rule, something that could not be said about the 1980s. Perhaps that is why, in the face of the objective conditions listed in this post, protest these days tends to happen at much “lower” levels of society, amongst oppressed factory workers and dispossessed peasants, rather than amongst intellectual elites. “protest these days tends to happen at much “lower” levels of society” maybe you are right,, the scale is enlarged. in some ways, 80s students are idealistic ,the situation is indeed riper today than 1989s altough far away from a revolution. at least workers and farmers need to accept some new political views, and they should combine and support the change of a society in the future. maybe internet will beneficial to this, and china will finally change with the grow of new generation. Maybe Wukan will be remembered as a new Shanghai Commune.